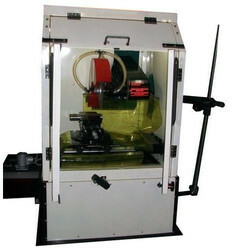 Offering you a complete choice of products which include abrasive cut off machine. Effortless cutting by lever mechanism, counter balancing. Robust construction and rigid clamping minimizing wheel breakage. Large and Effective coolant delivery by unique Design of casted wheel guard with focused veins. Control Panel incorporates door limit switch, emergency stop, illumination on/off & machine-on, switches. Indications of door open, power on, pump on. Covering other safety norms. Automatic heavy duty sectioning machine for large cross sections, irregular components. Automatic Clamping: T slotted bed clamping, fixed vice, Automatic filtration system. Automatic heavy duty sectioning machine for large cross sections, especially for taking longitudinal sections. Component is fed to the cutting wheel Programmable cycle of clamping, cutting, de - clamping. Looking for Industrial Cut Off Machine ?